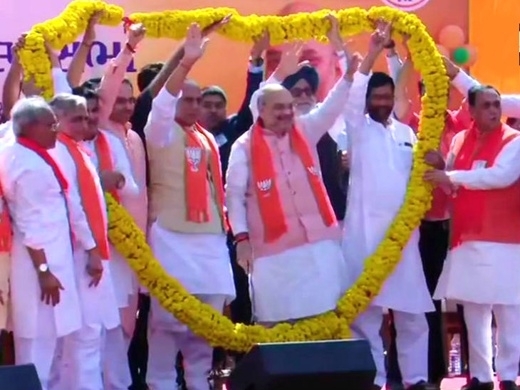 BJP National President Amit Shah will file nomination for the Lok Sabha polls today from Gujarat's Gandhinagar in the presence of Union Ministers Rajnath Singh and Nitin Gadkari. Shiv Sena Chief Uddhav Thackeray, apart from other allies, will also be in attendance. Mr Shah's candidature from Gandhinagar, which has traditionally been veteran leader LK Advani's seat, had triggered a political debate when the Bharatiya Janata Party announced its first list last week. Mr Advani, who was the Deputy Prime Minister in the government led by Atal Bihari Vajpayee, was among the 10-odd leaders above the age of 75, who the party dropped this time. "I started here in 1982 as a booth-level worker... From distributing pamphlets, putting up posters, doing booth-level work, today I am fortunate that my party - the BJP - has made me the national president of the world's largest party. It has been a great journey for me," Shah said. "If you take out BJP from my life, you will be left with zero (shunya)," he added.